Experiential. Unexpected. Exciting. Pop-up events are, well, popping up in many business sectors, including confer­ences and incentives. Staged in unique settings—think warehouses, parking lots or storage containers—pop-ups are designed to be memorable, one-time-only activities. “A pop-up experience is designed to shake things up, lifting people out of their frame of mind with something engaging,” says Jonathan Moneta, creative director at Toronto’s MakeLab, which executes tech-based interactive events using 3-D printers, architectural-grade laser cutters, light tables and food photo booths to create hands-on activities at galas and conferences. Done correctly, pop-ups can build brand awareness, introduce new corporate culture and attract diverse audi­ences. They can also give attendees a taste of the host city. Here’s how to orchestrate a successful event. Figure out what you want a pop-up to accom­plish, suggests Linda Farha, founder and chief connector of Toronto-based pop-up go, which services cities across North America by allow­ing users to list or select spaces online for free, or book the company’s strategic support to organize an event. Goals can include bringing vendors together, supporting a local charity or launching a product, she notes. Want to surprise and delight your attendees? Consider a pop-up dining experience or cooking demo. Looking to boost visibility for sponsors? An interactive pop-up experience in a tradeshow booth can increase booth visits and create a lasting impact, says Moneta. 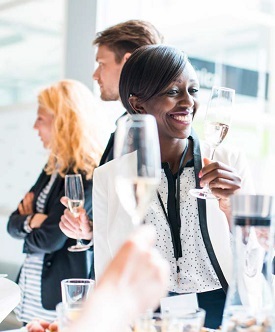 “Adding an experience to a booth sets it apart, and we’ve heard from clients that visits can some­times increase five to ten times, which can make a huge difference in cost-per-lead,” says Moneta, adding that turnkey activities need about two weeks to organize, while custom events can take six weeks or more. Lots of unused retail space is up for grabs for planners seeking a short-term rental. Think about your demographic, and who you want to attract, says Farha. Moneta suggests scouting unorthodox loca­tions within your venue if you’re hosting a conven­tion, such as underneath main lobby escalators. MakeLab offers a range of interactive experiences for small, medium and higher budgets, includ­ing digital graffiti mural-painting, an Edible Selfie Photo Booth that carves selfies onto cookies using a laser-cutting and engraving machine and a Design-Your-Own-Laser-Wearables Bar. Farha’s team recently held a pop-up in a parking lot near the Toronto Convention Centre for a beer company seeking to raise brand awareness, and set up a pop-up flower stand at Billy Bishop Airport’s arrivals area on Valentine’s Day. Planners can leverage mobile event apps to send banners or push notifications about pop-up events to their delegates. Or, promote your pop-up through another pop-up, suggests Moneta. “Sometimes we’ll do a small interactive in a higher-traffic area of a venue. Guests will then be invited to finish the experience at the main pop-up,” he explains. 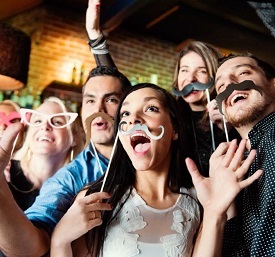 Above all, pop-ups provide a fun atmosphere guests want to participate in, allowing them to take home memories from your unique event.